Teams from Japan, Australia, Taiwan, China, and South Korea will battle it out. Who will take the top spot? The Asia Series has not perhaps become an integral part of the baseball calendar just yet, but organizers are hoping that November’s tournament is a step in the right direction. In the South Korean city of Busan, the champions of the respective leagues of Japan, Australia, Taiwan, China and the host nation (as well as Lotte Giants, the local team from Busan) will play it out for a chance to become Asian club champions. For the first time, there will be six instead of four teams involved. It all started in 2005 but ended in 2008 due to financial issues, as the main sponsor pulled out. During that time, Japan was the host but from last year, a new backer was found and Taiwan was the venue. 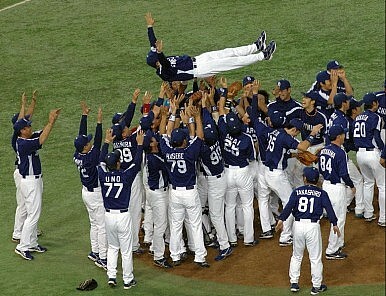 That also witnessed the first time that the competition was won by a team that wasn’t Japanese: The Samsung Lions from South Korea defeated Fukuoka Softbank Hawks in the final. With home advantage, the Korean teams will be looking to make it two in a row. Baseball is thriving in the country and the local league passed seven million spectators for the season for the first time ever earlier this month. The six teams will be split into two groups of three. After those three play each other, the winners of the two groups will meet in the final. Group A contains the Korean champions and the winners from China and Taiwan. Group B features the second Korean team, the Japanese champions and Perth. While most of the leagues are entering the final stages of their domestic seasons, Australia will send Perth Heat to represent that country’s league. “We’re incredibly proud as a league to be a part of this prestigious tournament," Australian Baseball League General Manager Ben Foster said. "The Asia Series provides us with a fantastic opportunity to demonstrate the quality of Australian baseball to a television audience which reaches into the tens of millions." “After their first taste last year, I am sure Perth will be much better prepared, and hopefully we’ll see them bring home the top prize”.